Picture from group : Ben Lugmore as seen from the west top. Picture: Ben Lugmore as seen from the west top. High centre of an exhilarating ridge. 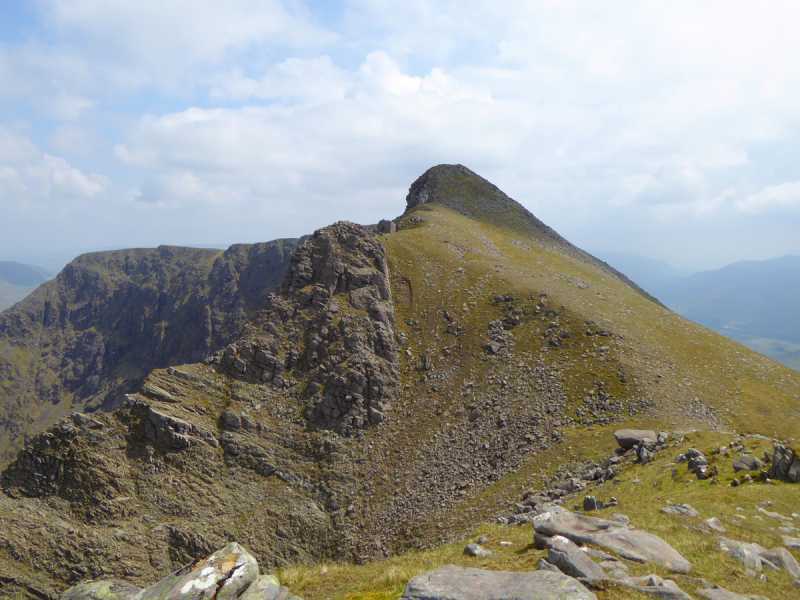 Ben Lugmore at 803m is the 18th highest peak in Ireland and only just short of Mweelrea. (814m). It has a dangerous 600m cliff face drop on the NE side to the Sruhauncullinmore valley and a marginally less steep drop in to the Owennaglogh valley to its South. Since the summit is part of a ridge formed by its West and East tops generally that's where access to it will be made along a distinct but not very developed path. Although there may appear from the cliff side to be extremely big drops between the summits of Ben Lugmore, this is not actually the case on the ground. The drop between Ben Lugmore and the West top is a steep but short 50m climb for example.